The Tank Pull Challenge is a physical test of endurance, as competitors must make a determined effort to overcome the impossible odds of moving an immovable object – an 80,000 pound tank mounted on a flatbed truck. The clarion call for the competitor is take up the challenge and overcome the impossible! 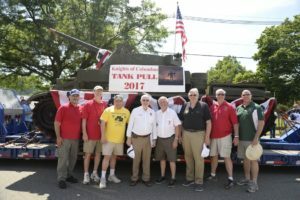 Taking part in the Tank Pull Competition benefits the veterans and particularly the Wounded Veterans financially and materially, and ensures that their service will not be forgotten. In the past seven years, the event has raised over $1 Million Dollars for wounded warriors.